On July 20, 2018, at 11:12 am, journalist and human rights defender Ahmed Al-Shaibani received a death threat by text message from an unknown number. Around the same time, activists on social networking pages circulated an official document, issued by security services, that made false accusations against Al-Shaibani stating that his journalistic and human rights activities amounted to "incitement to a coup." The source of the text message has not yet been established, despite all information having been provided to security authorities. Al-Shaibani told the Gulf Center for Human Rights (GCHR) that "the threat exists as long as the unknown person behind the threat remains unknown." Al-Shibani covered the demonstrations in Basra, in his city Diwaniyah, and in other cities in central and southern Iraq, including Baghdad. Protesters have been demanding an end to corruption, changes to central and local government so there can be the provision of proper services and the release of detained activists and protesters. 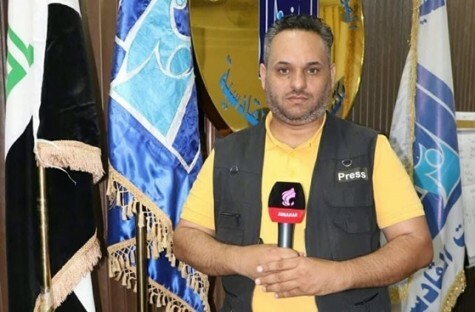 Ahmed Al-Shaibani is an independent journalist, blogger, human rights defender, a member of the Iraqi Network for Social Media (INSM) and the Iraqi Journalists Syndicate. He started his media career in 2009 and currently prepares and presents programs on a radio and television station called, "Here is Diwaniya". He is also an editor at Al-Manar News agency and a student in the Faculty of Information at the Islamic University in Najaf. GCHR condemns in the strongest terms, the threats against Ahmad Al-Shaibani and expresses deep concern about the situation of all human rights defenders in Iraq, including lawyers, journalists and bloggers who continue their work bravely in the face of grave danger. Ensure that all human rights defenders in Iraq are able to work without facing restrictions, threats and judicial harassment. GCHR calls on the authorities in Iraq to fulfill their fundamental duty to protect the Iraqi constitution, which stipulates in Article 38 the protection of public freedoms, including freedom of expression and freedom of demonstration. GCHR also calls upon them to maintain Iraq's international obligations as a signatory since 1971 to the International Covenant on Civil and Political Rights which obliges the parties to respect the civil and political rights of individuals, including the right to life, freedom of religion, freedom of expression and assembly, electoral rights and procedural rights to fair trial.